Hammond’s material metaphors referencing both the body and the landscape create “troubled sites,” what The New York Times art critic Holland Cotter has called “…. implied narratives of innocence lost through political, domestic, and psychological violation.” Combining oil paint, canvas, and paper with non-traditional materials such as latex rubber, linoleum, straw, leaves, and hair, along with weathered objects salvaged from abandoned farms, she constructs works that occupy a space between painting and sculpture while hinting at transgressions and violence within the domestic setting. Hammond continues this evocative material experimentation in other works in the show. 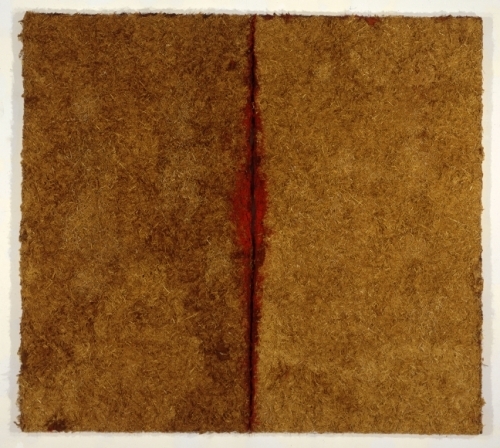 In the diptych Untitled (1995), for example, she uses straw and red paint to call up multiple bodies almost touching. Writing about the work, she states, “It’s about the meeting place, the crack, the space between. The tension of uneasy juxtaposition. A site of negotiation.” Cumulatively, the works in the exhibition continue Hammond’s post-minimal engagement with materials and process and a survivor aesthetic that began with her fabric sculptures in the early 1970s while also anticipating her materially informed paintings of the last decade.